Ashampoo Burning Studio 15 The new premium class. 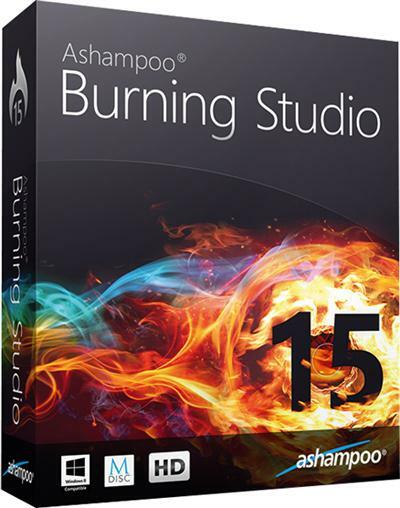 Ashampoo Burning Studio 15 is everything you asked for. Discover the easy way to achieve professional results with an incredible intuitive, compact, yet immensely powerful Ashampoo Burning application. Video DVDs with fully-animated menus, music CDs with individually designed covers, password-protected data backups and so much more just a few mouse clicks away. Turn your photos into slideshows, add music and comments or save your CD collection to your hard disk. Burning Studio 15 takes full advantage of your PCs capabilities to make the most out of your movies, photos and songs. Ashampoo Burning Studio 15 everything you need. Always ready, always the right feature. Burn data, music and videos to CD, DVD and Blu-ray and design individual menus for your movie discs. Use multi-session recording and other advanced features to create Autostart and bootable discs, spread large amounts of data across multiple discs automatically with disc spanning and encrypt sensitive information right from within the application. More leeway for creatives. Turn photos and videos into stunning presentations with various templates, stir emotions with music and sound effects or provide your own voice narration. Music enthusiasts will love the built-in sound editing support and the ability to create audio CDs complete with booklet and cover in no time. Keep your precious data safe. Back up files to DVD/Blu-ray or hard disk with password protection. Create backups from external drives and update existing archives. For maximum durability, use the new M-DISC support. Its like engraving your life in stone! Usability is king! From start page to settings dialog, Ashampoo Burning Studio 15 comes with a well-rounded, intuitive user interface in over 40 languages. The engine, the technical backbone, has undergone thousands of testing hours and guarantees stability and reliability for you and your data. You can customize the program's appearance with various existing skins or create your own for the first time. - Extract and burn your music. Rely on a vast array of supported formats.